When first meeting Goro Tatsumi in a gambling parlor, the player-character Raidou can read his thoughts (the end result of which is Tatsumi running away). Raidou can read the minds of the other people in the gambling parlor as well, including a “cold-eye gambler” who thinks to himself: “I think that Tatsumi fellow’s goin’ out with the dealer… That’s the only explanation. Then again, I thought that Tatsumi was the type that didn’t like women…” (according to this walkthrough). 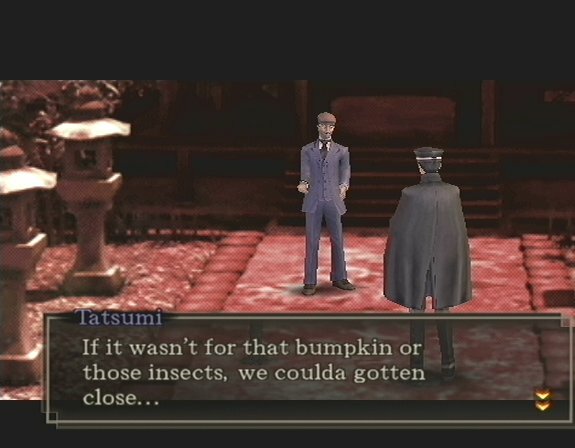 Later in the game, Tatsumi very subtly flirts with Raidou (image below). These have been read as signs that he is meant to be read as a gay character by some players (see here and here). These videos show the main interactions with Tatsumi (though not the above line): video 1 and video 2. This entry was posted in 2000s, Characters, Gay, Gay (explicit), Queer Men on December 10, 2015 by Adrienne Shaw.